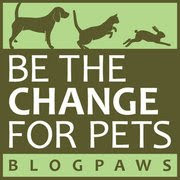 Today's "theme" over at BlogPaws is "Blog With Purpose". The questions for all of us are: What overall purpose does our blog serve? And, what purpose does each post serve? We think our overall purpose here at Bocci's Beefs is education—sharing with pet parents all we have learned (and that's a lot!) 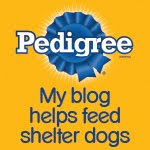 about caring for pets since we started blogging in 2009. What's you blog's purpose? My purpose is to play ball! Let's go, Parental Unit! Playin ball seems like a good purpose to me! Did someone say, "play ball?" We love that purpose, Bocci! Bocci??? You take your ball on road trips??? That is a good idea. Ernie thinks he will give it a try. 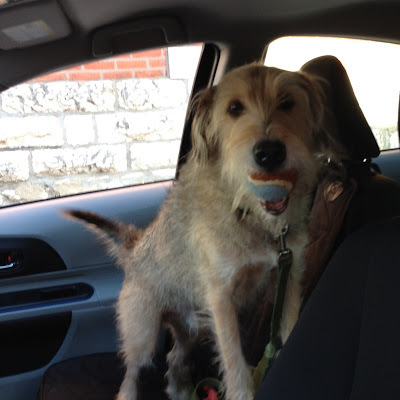 Of course, Frankie and Ernie—When we go the dog park, I take my favorite ASPCA ball!